Welcome to the home of Daniel and the Serpent, a Christian fantasy novel filled with action, mystery, suspense, and a dash of the enchanted. It has everything you expect from great Christian fantasy. You will be transported to another world called Hudoti and meet a discontent thirteen-year-old named Daniel. Daniel yearns for more than his primitive desert village can offer him. He dreams about sailing across the seas in search of treasure and adventure. However, his dreams turn into nightmares as he is throttled by a storm, thrown into a dungeon, and forced to assassinate a king with an enchanted sword. If he hopes to survive, he must rightly discern the advice of a perplexing sea serpent and an ancient scroll. Browse the website and experience a little of Daniel’s ocean adventure. Once you get your feet wet, I think you’ll dive in and join Daniel for his thrilling journey. Thanks for checking us out! "My ten-year-old son, Terrel, enjoyed Daniel and the Sea Serpent so much that one night he stayed up till 10:20 p.m. reading it before I found out and made him put it away. He just couldn't put it down." "Hey, it was awesome...It's one of my favorite books now." "My family really enjoyed this book! I would recommend it for youth-aged children and adults. It has a suspenseful story line and great character development. Overall, this book can be used to encourage good values and choices in our lives today. We are looking forward to the next book in this series to see what happens to Daniel!" "My grandson, who has Aspergers and doesn't like to read much, loves your book. He couldn't put it down. I think it will make a great gift for grandchildren from their grandparents." 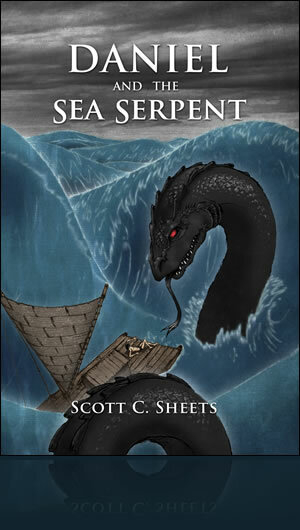 "The story of Daniel and the Sea Serpent will hold the reader captive from beginning to end. It is not only well written but uses descriptive words that will result in the reader's vocabulary development. The fantasy contains another level of meaning which can be a discussion starter for families. This book is also appropriate for a parent to read to younger children because of the high level of action and intrigue. I recommend this book wholeheartedly for families and for classrooms." Scott Sheets grew up among the fields of Northwest Ohio and graduated from a country school with a class of about 120. The idea of Daniel and the Sea Serpent came out of a story told to my children to pass the time while we traveled on a family vacation. My children enjoyed it so much that I decided to put the thoughts and words on paper.